The Nerd Mentality is teaming up with Universal Pictures to give away Atomic Blonde on Blu-ray! Atomic Blonde is a high-stakes, global action-thriller that takes place in the city of Berlin, on the eve of the Wall’s collapse and the shifting of superpower alliances. Charlize Theron (“Mad Max: Fury Road”) portrays Lorraine Broughton, a top-level spy for MI6, who is dispatched to Berlin to take down a ruthless espionage ring that has just killed an undercover agent for reasons unknown. She is ordered to cooperate with Berlin station chief David Percival (James McAvoy of “X-Men”), and the two form an uneasy alliance, unleashing their full arsenal of skills in pursuing a threat that jeopardizes the West’s entire intelligence operation. To win just comment below and tell us what was your favorite action film released this year either theatrically or on Blu-ray. 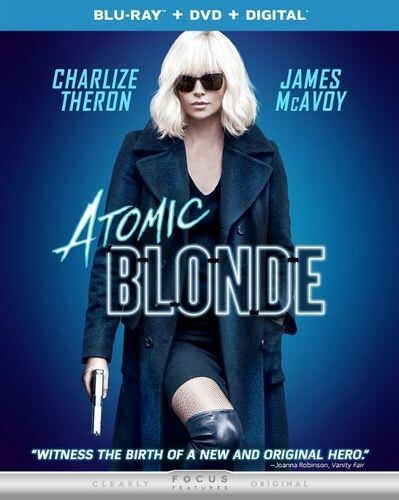 This Atomic Blonde Giveaway is only open to those in the U.S. or Canada and a winner will be chosen on Monday 11/20. Also be on the lookout for Dusty’s review of the film and how the 4K UHD stacks up right here on thenerdmentality.com! For those that weren’t lucky enough to win you can always pick the Blu-ray up from Amazon or other retailers starting on 11/14. Giveaway has now ended, thanks for participating. Winner will be notified shortly! The Unicorn & The Dozer Episode 9: Surprise, Surprise, Surprise!